Welcome to a very special month of Crushing Krisis, which I have dubbed “Blog of Tomorrow”! Why is it so special? I’m glad you asked! I am marking my ten-year anniversary of using WordPress with the launch of a Patreon campaign. Patreon allows readers to become Patrons who cover the costs of running CK. Rather than tempt you to pledge your support with promises of future content you can only imagine (and that I might not be able to produce), I’m bringing you the real thing – along with the 16 years of blog posts and comprehensive Marvel Collecting Guides you already love. For the next 30 days you’ll get a future vision of what I think CK could be a year from now with your regular support and interaction, and with my full non-parenting attention on blogging. It’s something I’ve never had the opportunity to do before. My hope is that if you love it, you’ll become a Patron to help me make this a reality for CK. I want you to feel the need check Crushing Krisis every single day the way you would all your other favorite websites. The difference is that I’m doing this all on my own without other contributors, artists, editors, or advertising dollars. And, while posting won’t remain at this insane intensity come December, it will still feature regular content just like what I’m producing this month. Here’s my pitch video from Patreon, where I’ll be making another series of almost-daily posts to explore behind-the-scenes details of running a 16-yr-old blog. At the end of the month, commenters, mailing list subscribers, and Patrons will help me decide what future content to focus on first. We’ll unlock new and regular features as the pledge total rises. Want Wonder Woman and Maurice Sendak readalongs instead of Image and Dr. Seuss? Want more original music and less music essays? Wish I’d talk more about movies? I’ll be asking you at the end of the month. Read on for more of the backstory on this unprecedented month of content. 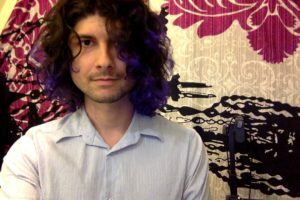 Ten years ago this month I reached the utter limits of my frustration with Blogger.com in the midst of my first year participating in National Blog Posting Month and in a single night fit of pique switched all of Crushing Krisis over to WordPress. It was one of the best decisions I’ve made in the course of my blogging career. That month has always stuck out for me as a favorite of CK for a few reasons. It featured a hi-fidelity season of my songwriter podcast Trio. It introduced the ongoing character of OCD Godzilla to the blog. But, my favorite, is that its ongoing conceit was of a comics-style reboot like the aftermath of Crisis on Infinite Earths, where every character was introduced anew. It was a weird bit of prescience on my part, since it would be another four years before CK’s first comic guide was introduced. For the 10th anniversary of that, I’m drawing on another familiar comic trope from a less-familiar continuity: time travel and Image Comics. Lots of comics feature time travel,from DC’s Legion of Superheroes to pretty much every X-Men story told these days. 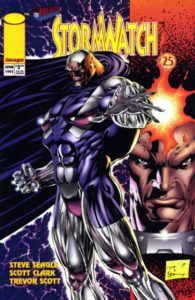 Image gave the trope a unique twist in 1993, when three Extreme Studios books and WildStorm’s StormWatch published their 25th issues over a year ahead of schedule, but vowed they would fit perfectly into continuity when that point actually arrived. The gimmick was two-fold: tease readers with a glimpse of hard-to-understand future continuity, but also make the implicit promise that the books would run that long (Image wasn’t exactly known for consistency at that point). Intriguingly, the two books that managed to make good on the 25th issue promise were Stormwatch and Extreme’s Supreme, both of which later became late-90s breakout hits and are remembered as two of Image’s most influential series. I can’t tell the future like a comic writer, but I have a pretty good idea of what my ideal version of CK would be if I knew it’s hosting and software costs were being paid for by readers. Rather than wax philosophical about the would-be future you could enjoy if CK was generating a slew of revenue from Patrons, I’m simply going to deliver it this month as if CK is my fully-paid, full-time job. Be warned: next month won’t keep up this break-neck pace. But, also know that my goals for pledging are totally within the realm of reality – if every regular weekly reader of CK pledge between $1-6 dollars a month all this and more could be a reality. Tune in, strap in, and get your reading glasses – this is going to be a wild month of Crushing Krisis.